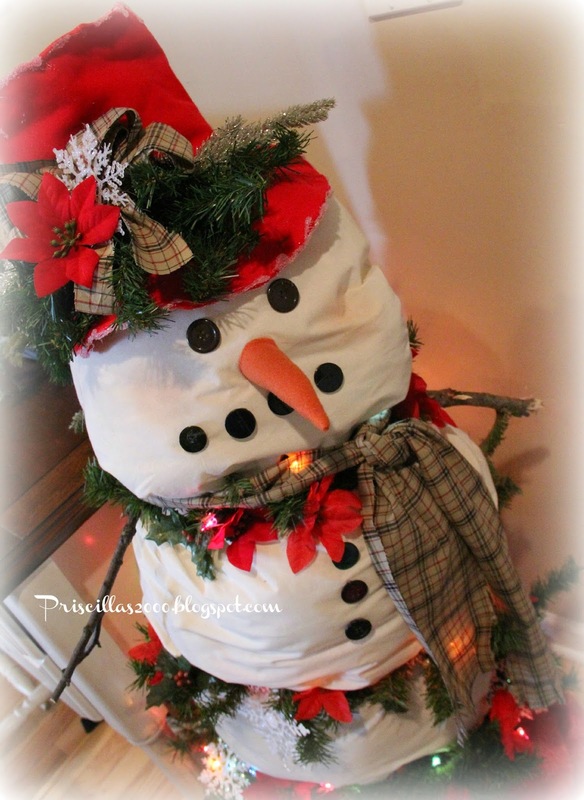 The front porch is decorated with a vintage blow mold Santa ..a DIY santa countdown.. A burlap ..decomesh and white light garland..
On the front door ,the wreath has a thrift store silver frame ,painted with chalkkboard paint. The message on the tray is written with a paint pen..to look like chalk. 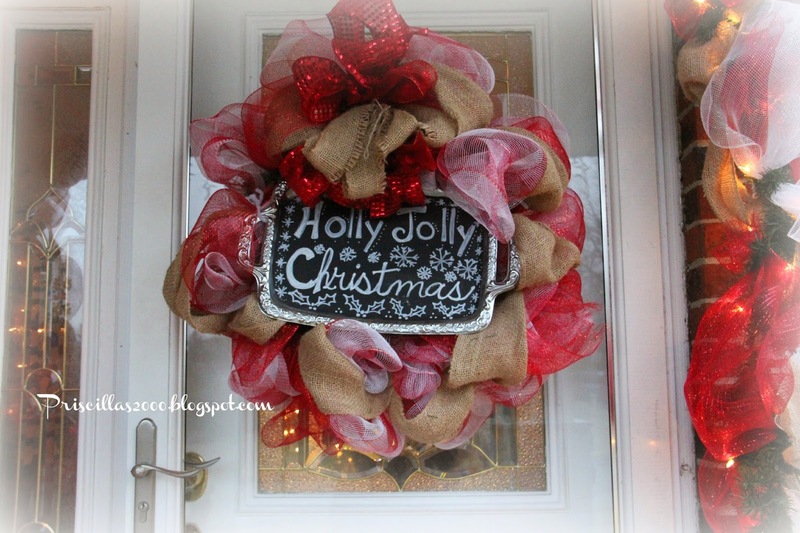 The wreath is also made from decomesh and burlap. 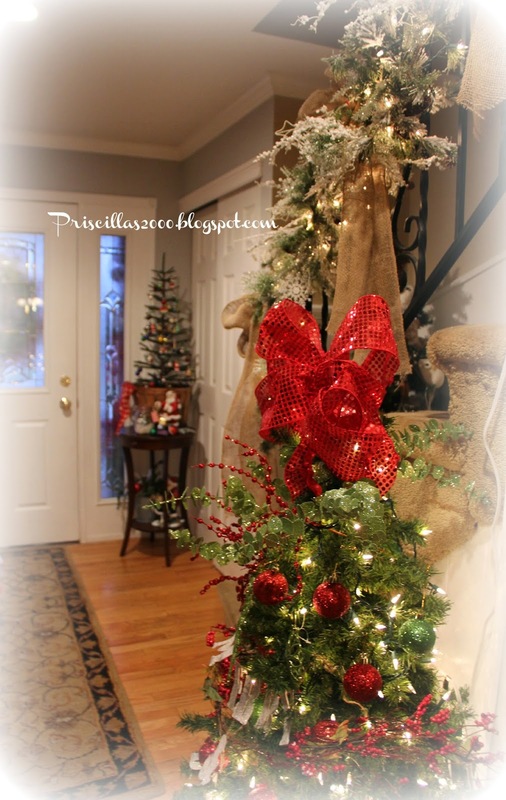 When you come in the front door you can see the wreaths in the kitchen windows ..2 trees are in the foyer and the little one on the table by the door .. The owl tree and the Merry and Bright tree in the basket . 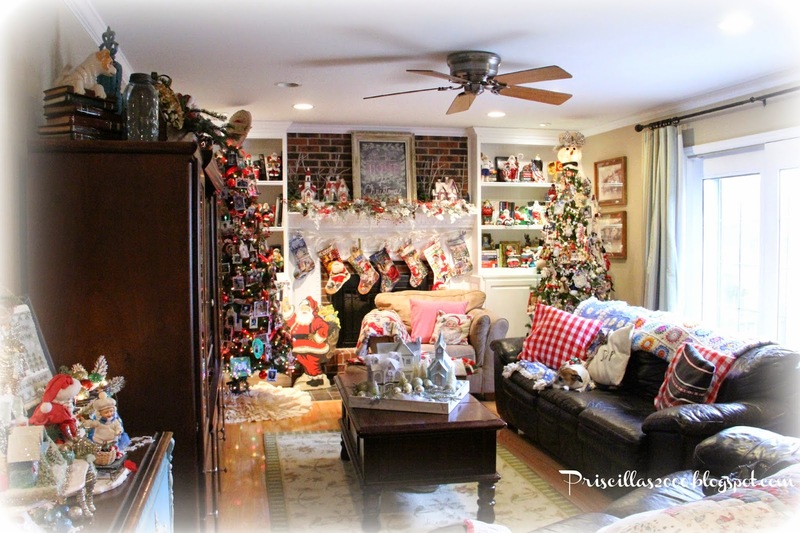 The living room has the big ( real) frasier fir with all the family collected ornaments..
Also in the living room is the new flocked tree..
Flocked wreaths hang in the living room windows from burlap. The Christmas Village in the living room ..with the Santa Tree and the gold tree. 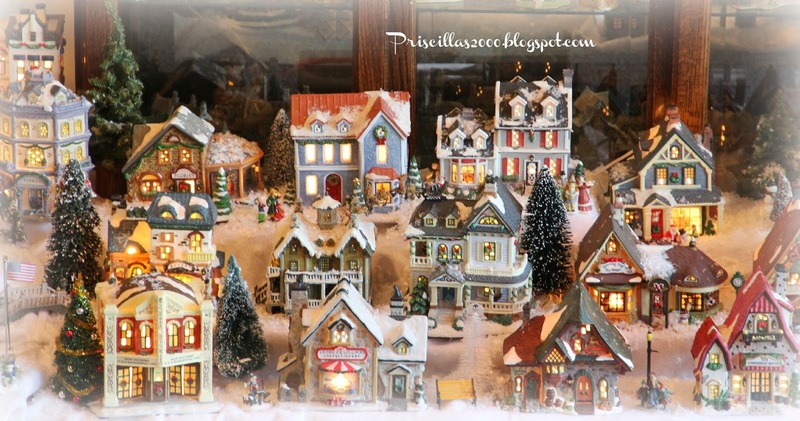 This year the Christmas Village surrounds two trees in the living room ! 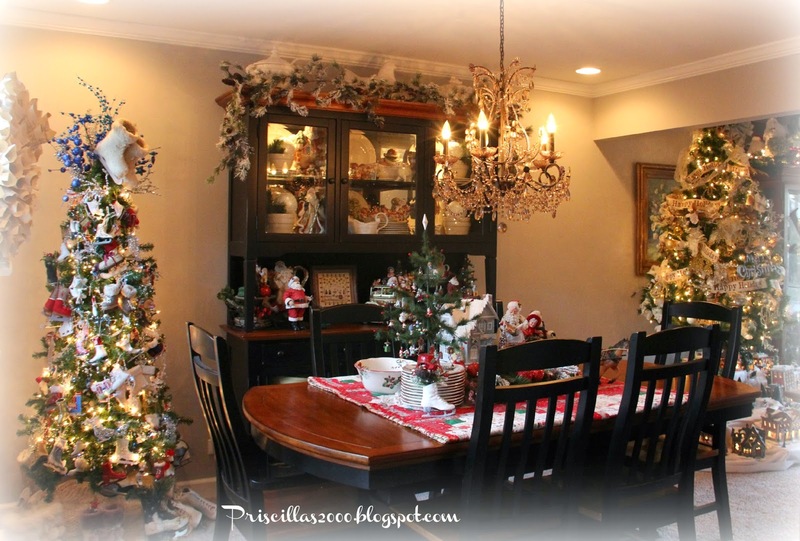 IN the dining room the hutch , buffet and table are all decorated. 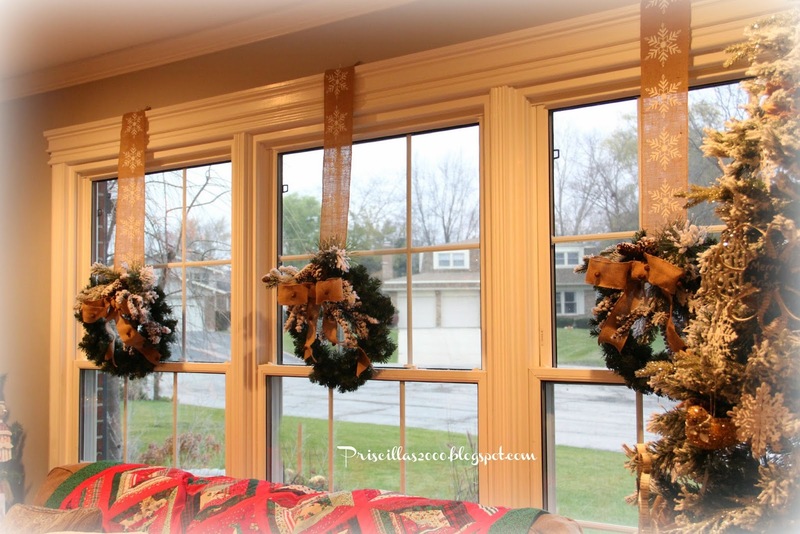 The ice skate tree sits in the corner of this room.. A book page wreath hangs in the window. In the kitchen the galvanized tiered tray sits on the table. 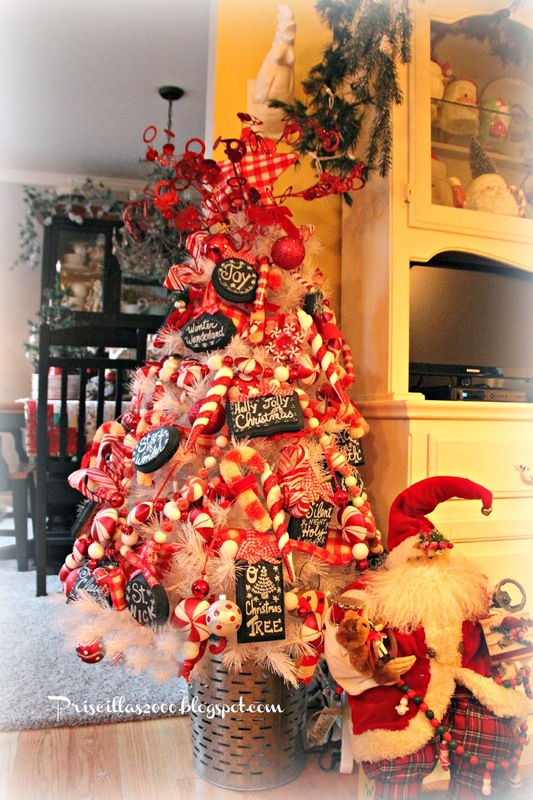 The candy cane tree sits in a olive bucket. 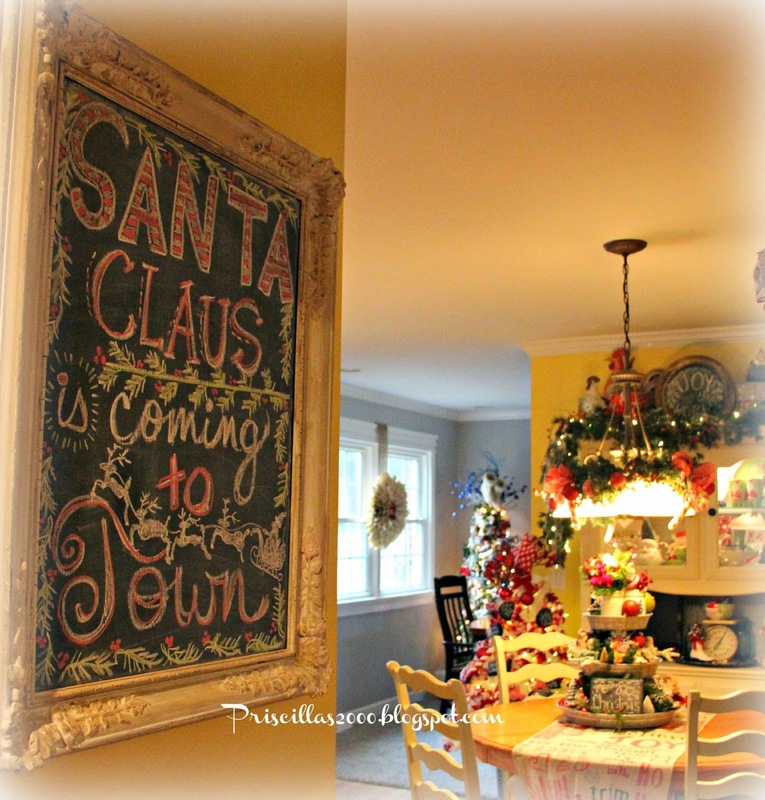 The seasonal chalkboard with this months theme.. 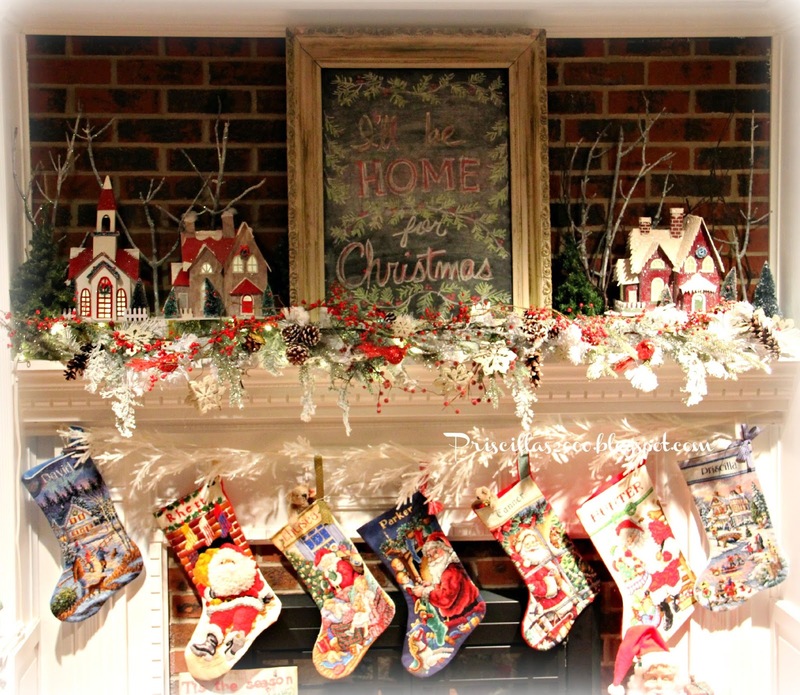 In the family room the mantel over the fireplace holds a chalkboard message and all the handmade stockings..
Another bookpage wreath , more chalkboards,and vintage goodies are on the side tables. 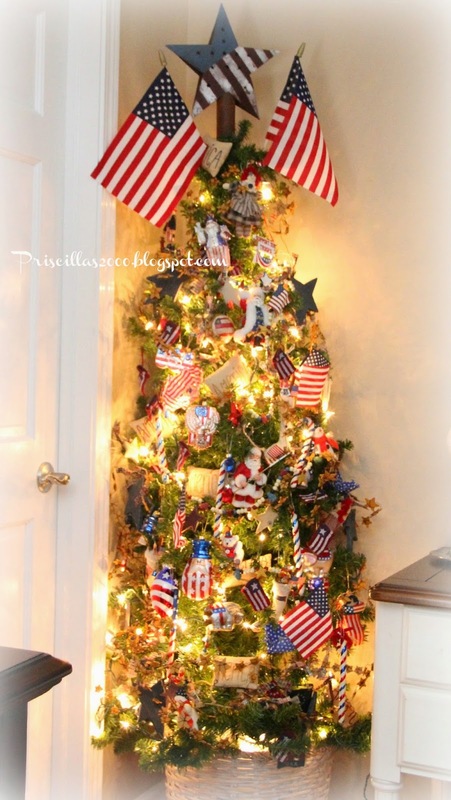 The last of the 4 trees in the family room is the Americana tree.. 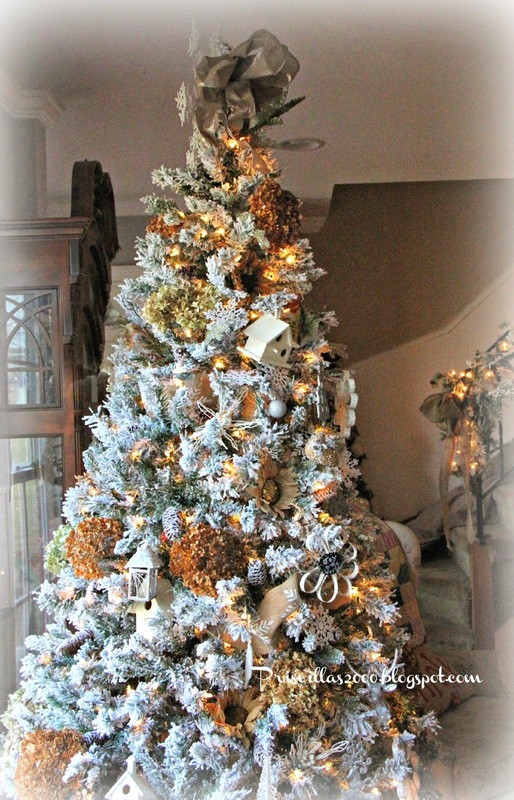 I haven't shown you this tree yet ..it is the only tree upstairs and it is in the master bedroom.. 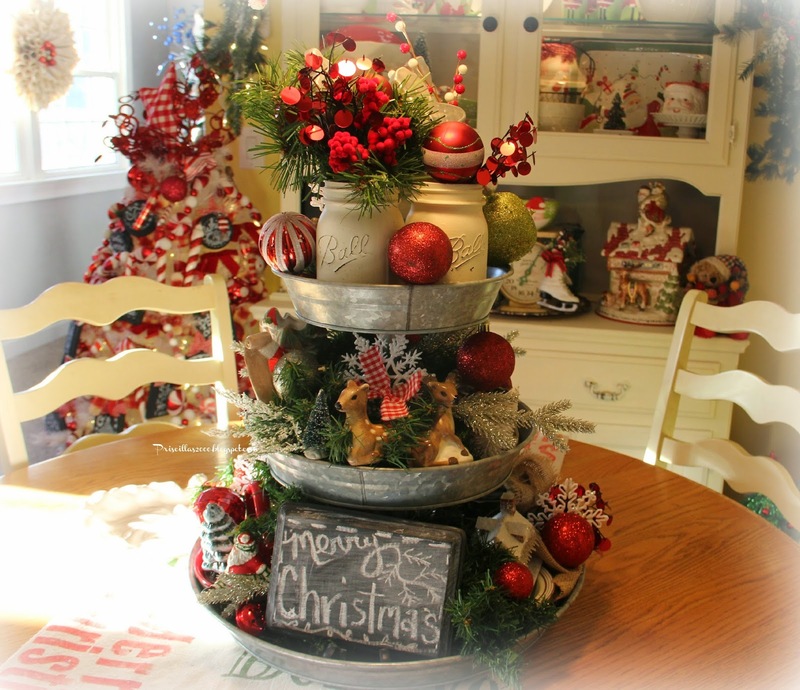 It is tree # 13 ..Its standing in a vintage wood crate. 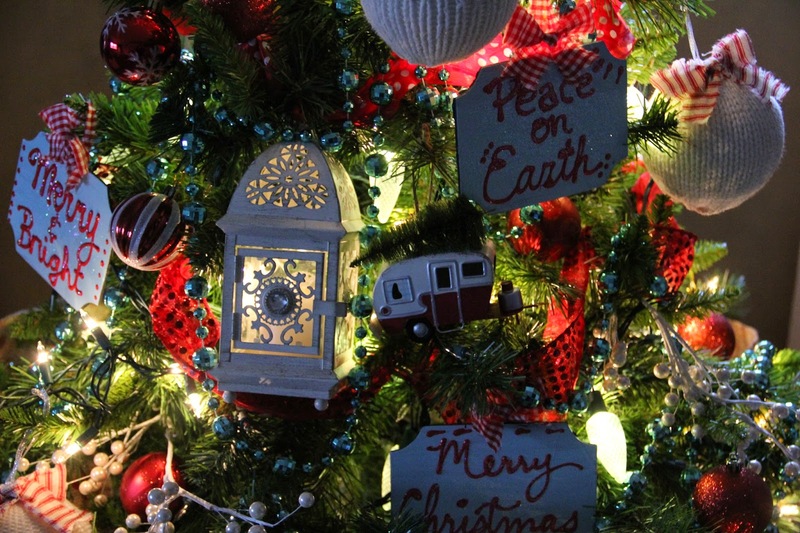 It is decorated with DIY sweater ball ornaments, red ribbons for garlands...aqua painted plaques with glitter and red words.. a lantern and a little camper ornament from Target . Pearl sprigs are aslo used to bring in some white. The wood shapes came from Joann Fabrics. I used them for our Halloween mantel last year and just painted over the chalkboard paint. 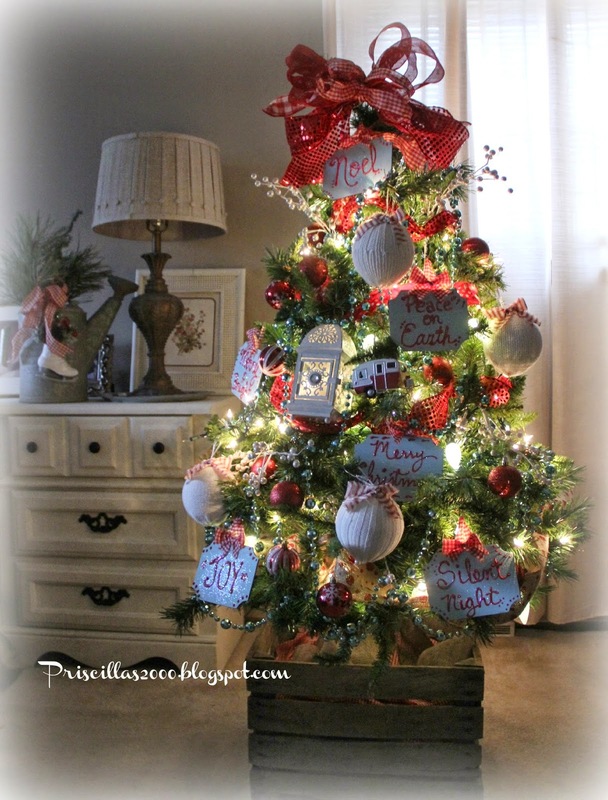 I use red puffy paint to write the Christmas sayings and sprinkled them with glitter. I got styraphome balls from Walmart for 48 cents each and used some thrift store sweater sleeves to make the balls .They each got a red ticking stripe bow on the top . Hope you all have wonderful celebrations with your family and friends ! Thanks so much for reading and commenting on my blog ! Your home is just beautiful and ready for the big day! A very merry Christmas to you and your family. Wow! You know how to do Christmas! I love all the themed trees but I can't tell you which I like best. They are all great and each has a personality of its own. 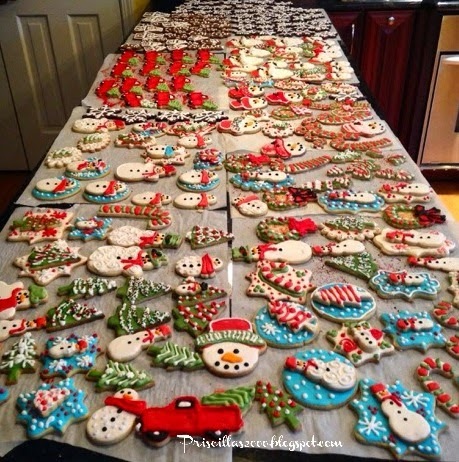 I can't imagine the task of taking them all down. Putting up is fun, down not so much. Hope your Christmas is a merry one and that you have many to enjoy your joy. Oh my! Everything is just wonderfully put together! I am going back to look some more. Just wonderful! You are officially the "Queen of Christmas," Priscilla!! 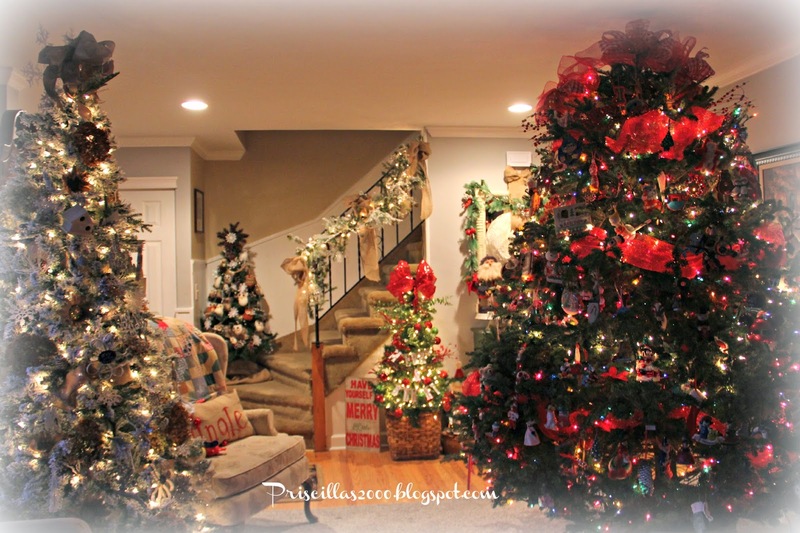 I am truly in awe of your beautifully decorated home... Now relax and enjoy all your hard work with your family nearby--Merry Christmas!! WOW!!! I have already made a version of your chalkboard for my front door! Saw a few other things for inspiration too! 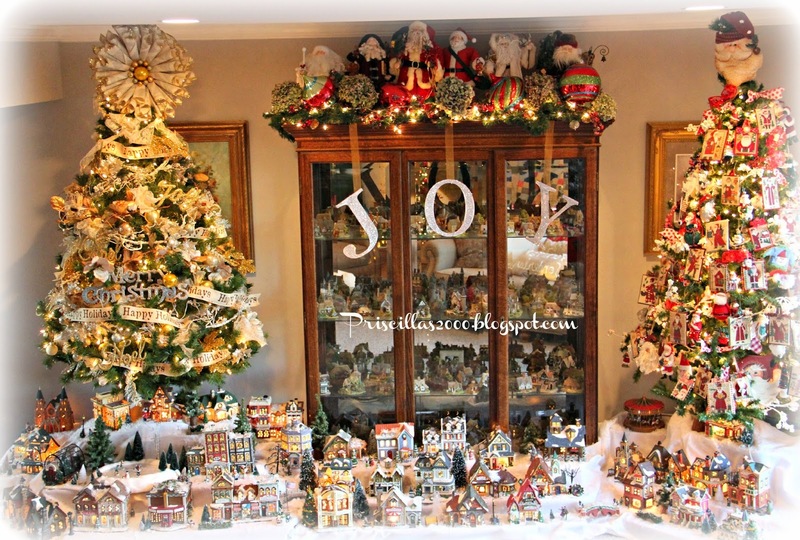 I have quite a collection of ornaments, and always enjoy seeing other's! Beautiful! I'm both speechless and breathless. I still don't know how you do it. Where and when do you have the time and energy to pull this off? 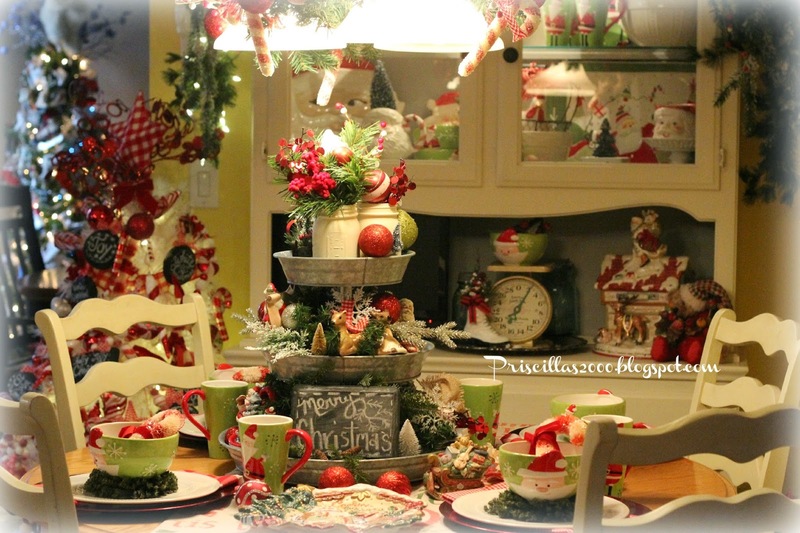 This is wonderful and really puts me in the mood for Christmas! Thx, Priscilla. 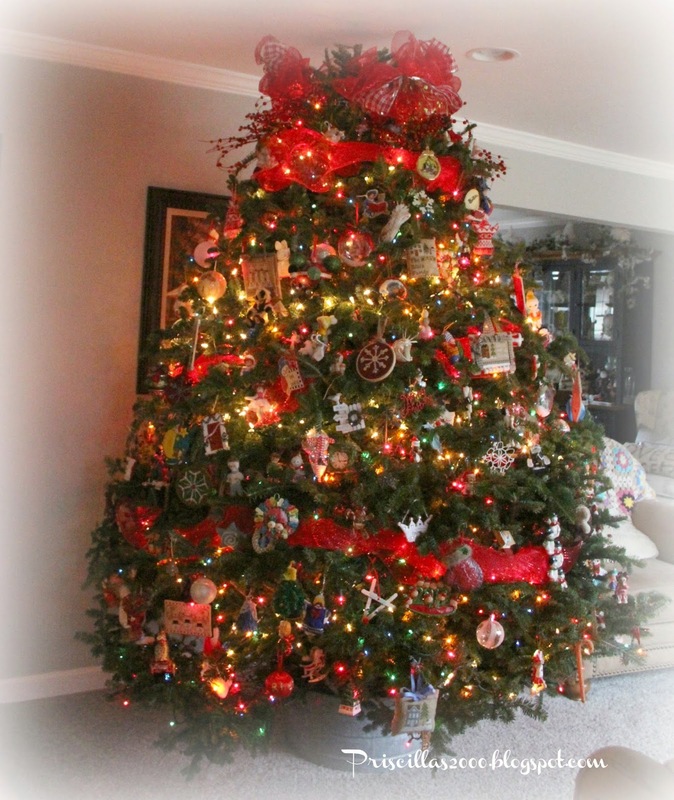 Have a wonderful, safe, and warm Christmas and New Year's. Gosh--it is so festive! I am going to share all the trees/posts when my family gets here, just to get them stoked!!! Thanks for sharing--so glad I found your blog! I will check FB for the future! Hope that you and yours have a very Merry Christmas! Came over from met Mon. 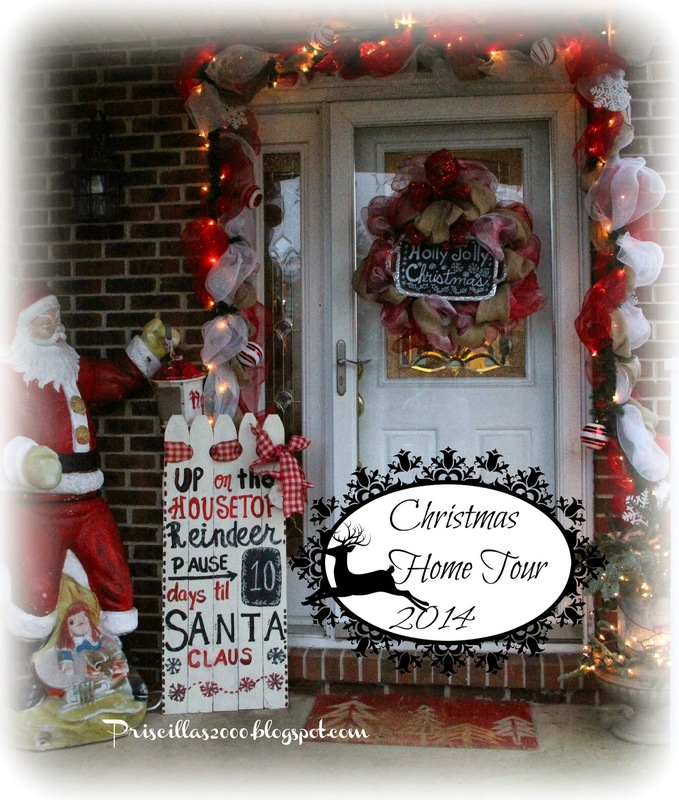 I did my home tour on there today too, plus 2 other posts. 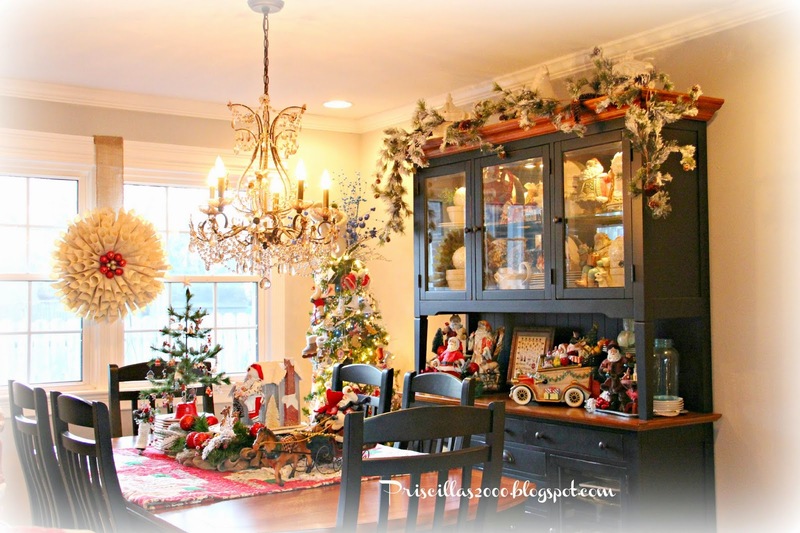 Your beautiful home is a Christmas wonderland!!! I am going to try to go see each post too!!! I want to see all the details!!! Thanks for sharing. I have no idea how you have time to do all this!!!! 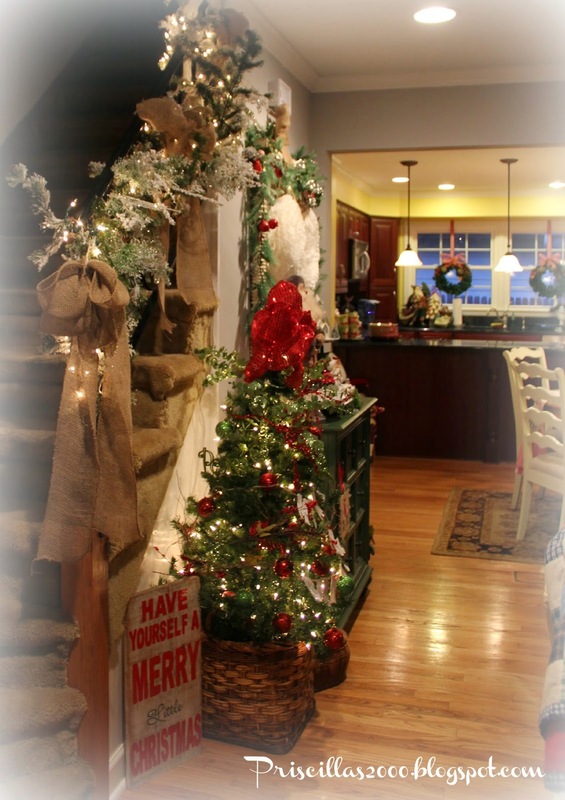 Thanks so much for sharing your beautiful home all decked out for the Holidays with us!! 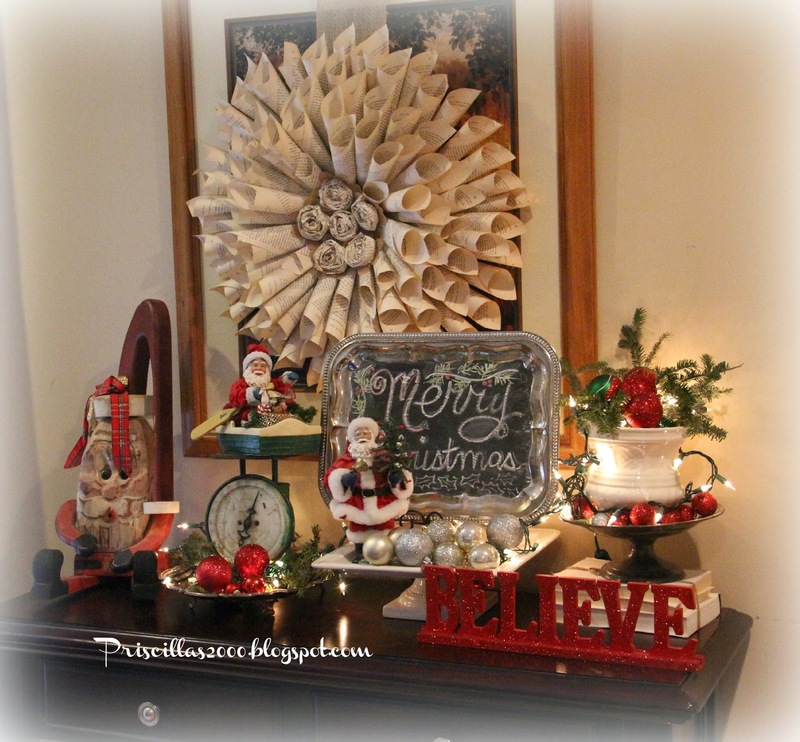 It has been such a pleasure seeing all your creations and how you decorate for Christmas and all the love that you put into your home! You have been a inspiration to so many of us not only at Christmas but through the whole year!! Wow! Everything looks beautiful, a Christmas wonderland!